The gaze almost detaches ourselves with consciousness, its the connection between the viewer and the subject matter. When looking at another human being we can presume someones mood, attitude or intention from their facial expressions, this can be a overpowering factor in art and design purely because of the effects this can achieve. 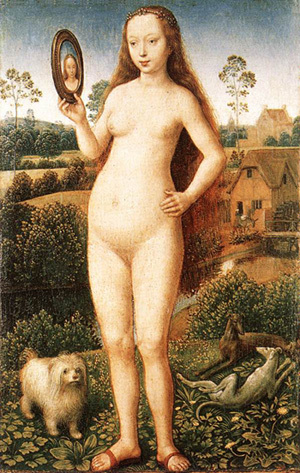 'men act and women appear"
The quote above is very relevant to the time at which Hans produced the painting Vanity due to the male dominance of the 1400's. The men possessed the wealth and therefore had ost works of art were produced by men because they money to pay for it, art was a product of the upper classes. As a result this had a massive influence on the subject matter, women are treated as an object to be viewed by the man. Hans Memling was a German-born painter who moved to Flanders and worked in the tradition of Early Netherlandish painting, becoming one of the leading artists from the 1460s until the end of his life, painting both portraits and several large religious works. Women Know they are being Looked at. The mirror in the painting distracts the models eyes almost involving her in a physical action, distracting her attention from fully focusing on the audience. The Yves Saint Laurent advert on the right above was changed from being horizontal to being arrange vertically to add emphasis to the direction at which you look, pushing you attention on the face rather than the eyes. •Women not only marginalised but supposed to be marginalised. Looking is not indifferent. There can never be any question of 'just looking'. The video below Is a really good example of the female gaze, How women have been objectified to sell a product. If you watch the video below and count how many times you catch the women on screen stare right into the camera this becomes more apparent. Their beauty and aura put across in the video subliminally sells you the Ipad.